do not disconnect the coupler from ecm, battery cable from battery, ecm ground wire from engine or main fuse before confirming dtc (diagnostic trouble code) stored in memory. Such disconnection may erase memorized information in ecm memory. Dtc stored in ecm memory can be checked by the special tool. Before checking dtc, read self-diagnosis function “user mode and dealer mode” (refer to “self-diagnosis function” .) Carefully to have good understanding as to what functions are available and how to use it. Be sure to read “precautions for electrical circuit service” (refer to “precautions for electrical circuit service” in section 00 (page 00-2).) Before inspection and observe what is written there. Connect the special tool to the mode select switch coupler. Start the engine or crank the engine for more than 4 seconds. Turn the special tool’s switch on. Check the dtc to determine the malfunction part. Refer to “dtc table” . After repairing the trouble, turn off the ignition switch and turn on again. If dtc is indicated (c00), the malfunction is cleared. even though dtc (c00) is indicated, the previous malfunction history dtc still remains stored in the ecm. Therefore, erase the history dtc memorized in the ecm using sds. Dtc is memorized in the ecm also when the lead wire coupler of any sensor is disconnected. Therefore, when a lead wire coupler has been disconnected at the time of diagnosis, erase the stored history dtc using sds. Refer to “use of sds diagnosis reset procedures” . Turn the ignition switch off and disconnect the special tool from the mode select switch coupler. do not disconnect the coupler from ecm, battery cable from battery, ecm ground wire from the engine or main fuse before confirming dtc (diagnostic trouble code) stored in memory. Such disconnection may erase the memorized information in ecm memory. Dtc stored in ecm memory can be checked by sds. Be sure to read “precautions for electrical circuit service” in section 00 (page 00-2) before inspection and observe what is written there. Click the dtc inspection button (1). 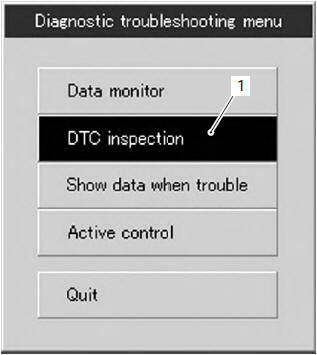 read the dtc (diagnostic trouble code) and show data when trouble (displaying data at the time of dtc) according to instructions displayed on sds. After repairing the trouble, clear to delete history code (past dtc). Refer to “use of sds diagnosis reset procedures” . 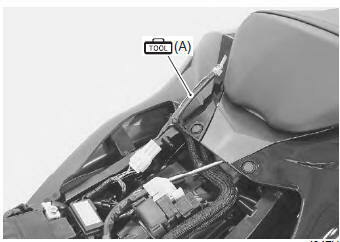 Disconnect the sds tool and install the front seat.